If only we could put happiness in a bottle and access it when we are feeling down. I’m learning that feeling happy is not only dependent on what’s happening around us, but on what’s happening on the inside too. I don’t know the secret to happiness or how to feel happy all the time, but here are a few things I do know about happiness. It’s ok not to feel ok all the time. Happiness comes and goes and then it comes back again. People aren’t always as happy as they want you to think they are. We can go through something really hard or sad and still feel happy. We have more power than we think when it comes to creating happiness. Two of my favorite people, Marc and Angel Chernoff specialize in cultivating love and happiness. They study positive psychology, write about what they learn and even host an annual conference to encourage others to live differently by thinking differently. They share amazing, inspiring information but what I really love about them is that they walk the walk. I’ve spent time with them, had very meaningful conversations with them, watched them with their son, their parents, friends, and clients. They are the real deal. Their desire to lift people up is palpable. I’m happy to celebrate the release of their new book, Getting Back to Happy. It invites us to change our lives by changing our thoughts. The powerful lessons and action steps delivered throughout the book mixed with beautiful stories of people experiencing heartbreak, trauma, and hopelessness who rise up don’t just bring us back to happy. They bring us back to hope, to love, and to trusting ourselves to become who we want to be and to live rich, full lives full of what matters most. Again, while I don’t know the secret to happiness, what I do know is that we have the power to infuse our days with little boosts of happiness, even when things are messy, or painful. Making someone else happy. Send flowers, or a text message, or something else. Boosting someone’s happiness always boosts mine too. Be Grateful. Find something – even the tiniest thing to be grateful for. Take a joy walk. Leave your step counter at home and walk for the joy of it. Notice the beauty around you. Make your walk an adventure to spot things that make you smile. Shorten your to-do list. If I’m overwhelmed with too many things to do, I don’t feel happy. When I lighten up my list, I lighten my heart at the same time. Write your happy down. Reflect on the ordinary, everyday things that make you happy and write them down. Use your list as a reminder that even when everything feels chaotic or messy, you have a reserve of happiness to tap into. Things on my list include cuddles with this pup, sunrises and sunsets, music and coffee. 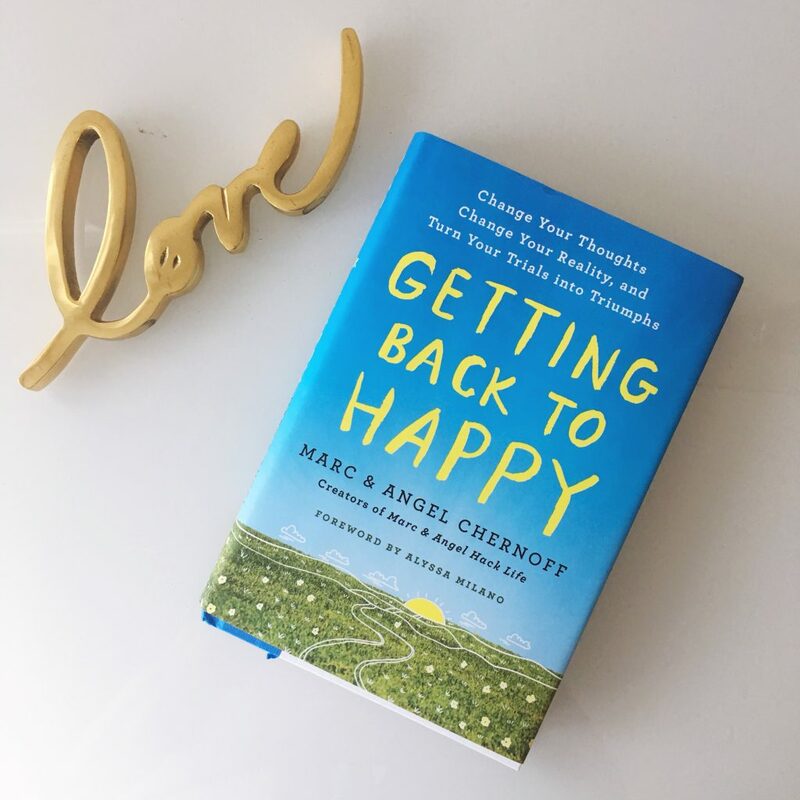 Find Marc and Angel’s book, Getting Back to Happy here or enter to win a copy here on Instagram with your best happiness boosting suggestion. I’m enjoying your book at present, and will look for their book. Reflecting on things to be grateful for is certainly a great happiness boost. Yesterday, I took a bike ride around the neighborhood for no purpose- I guess a “joy-bike” and it made me feel 12 years old in the best of ways! Reading to me is another way to get a happiness boost, so thank you for the recommendation! I agree that happiness can come in bursts and that reaching out in service will help us feel happy. One thing I do know is that I am not always happy, but I can always feel a deep sense of joy and peace which comes from knowing who I am. Joy also comes from living true principles. This book looks thought provoking. Thank you for sharing! For me spending time with animals makes me happy. Whether it’s my cats, a friend’s dog, horseback riding, or bird watching, animals get me out of my thinking mind and into the present. I absolutely love and connect with your first two points. (that it’s OK not to feel OK all of the time and that happiness comes and goes). No matter how much I simplified my life over the past 5 years, I didn’t break past a certain point until I truly embraced these ideas. I needed to give myself permission to have bad days, and realize that I’d have many weeks in a row of feeling really really good and happy, and then a week or two that weren’t horrible but weren’t all rainbows and butterflies either. Thanks for the post!